AUCTION DATE: THURSDAY, SEPTEMBER 26, 2013- STARTING @ 11:00 A.M.
2000 AMADA FBD 1253NT, 118’’ X 125 TON HYD MULTI AXIS PRESS BRAKE, S/N 12530299. AMADA RG-35, 4FT X 35 TON CNC HYD PRESS BRAKE, W/ NC9EX 3 AXIS CONTROL. 1984 AMADA RG-100, 10FT X 100 TON CNC HYD PRESS BRAKE, W/ NC9EX 3 AXIS CONTROL, S/N 102695. 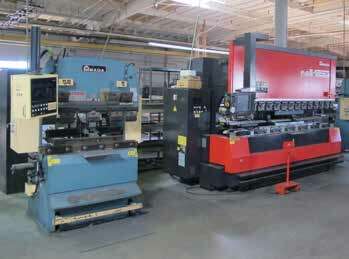 LARGE SELECTION OF AMADA PRESS BRAKE FORMING DIES. 1991 AMADA PEGA 357, 33 TON CNC TURRET PUNCH, WITH O4PC CONTROL, AUTO INDEX, 58 STATION TURRET, THICK TURRET, S/N 03572009. 1985 AMADA PEGA 345 KING, 33 TON CNC TURRET PUNCH, WITH FANUC 6M CONTROL, AUTO INDEX, 58 STATION, THICK TURRET, S/N P3450037. 1985 AMADA PEGA 345 KING, 33 TON CNC TURRET PUNCH, WITH FANUC 6M CONTROL, AUTO INDEX, 58 STATION TURRET, THICK TURRET, S/N 450008. 1986 AMADA PEGA 345 KING, 33 TON CNC TURRET PUNCH, WITH FANUC 6M CONTROL, AUTO INDEX, 58 STATION TURRET, THICK TURRET, S/N 45042. KOMATSU PG50, 1100 LB CAP FORKLIFT, 3 STAGE, WITH PNEUMACTIC TIRES. SHELVING, RACKING, CARTS AND ETC. LARGE SELECTION OF AMADA THICK TURRET PUNCH AND DIES. AMADA 8FT X .177’’ MECHANICAL POWER SHEAR, SQUARING ARM. TIMESAVER MODEL 37-HDCMW, 37’’ WET WIDE BELT GRAINER. ACME 100 KVA SPOT WELDER WITH JANDA 600V CONTROL. LORS 30 KVA SPOT WELDER, MODEL 130AP. MILLER WELDER SYNCROWAVE MODEL 180SD. BOYAR SCHULTZ 6 X 18 SURFACE GRINDER. 2008 FORD E-150, AUTO CARGO VAN.